> Research Library > eDataSource > 3 Remarkable email Tools - Now for the first time all in one place - Edatasource. Looking to improve your email campaigns? Now you can with 3 remarkable email tools. 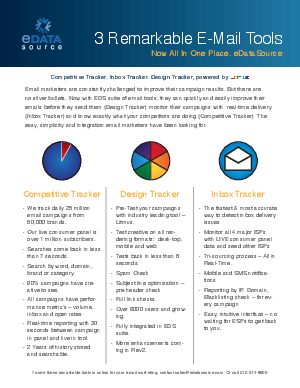 Competitive Tracker - email data & creative on what your direct competitors are doing. Design Tracker, powered by Litmus - pre test the campaign before you hit send button. Inbox-tracker - know in real-time your inbox delivery. Learn more by downloading our quick overview white paper.